Classical Net Review - Górecki - Kleines Requiem für eine Polka, etc. Nonesuch continues with its exploration of Górecki's music, this time with the London Sinfonietta – for my money, one of the première contemporary music ensembles. As far as I know, none of these works appears elsewhere. It took me a very long time just to get around the title Kleines Requiem für eine Polka (little requiem for a polka). What could Górecki possibly have had in mind? 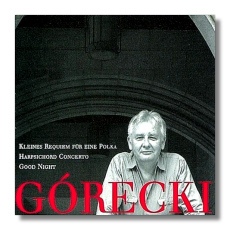 Górecki doesn't strike me as artistically playful, and certainly not here – a very solemn work indeed. The work contains nothing resembling a polka. However, since "polka" means "Polish girl" or "Polish woman," the work may be a personal memorial. David Drew, the album annotator, confesses he hasn't a clue either, and, in any case, Górecki ain't talking. Quite clearly, however, Górecki uses the musical iconography of requiems and services for the dead, particularly the idea of the tolling bell and instrumental writing that suggests chant and chorale. He's very serious about the "requiem" part. The work moves with the drawn-out sense of passing time, familiar to those who know this composer. Textures, while beautiful, are very lean, often reducing to one or two instruments. The first movement introduces the tolling bell and a chant – not really a theme as much as an interval, the minor third. The second movement presents an angrier version of the first for about half its length. The wrath fades into a death knell in the piano, from which a clarinet chant, similar in shape to the chant in the first movement, emerges. The movement ends with the hint of a chorale, reminiscent of the Russian Orthodox church. Why that church from a Roman Catholic communicant, I have no idea, but it's a beautiful fragment. The third movement is Khachaturian's "Sabre Dance" on diet-pill amphetamines. This is the closest we come to a dance-like movement in the entire piece, but, speaking as a boy from Frank Yankovic's home town, I know it's no polka. The work ends with the chorale idea. I found that the piece grew on me as I listened to it over and over. Oddly enough, a piece with so few ideas in it, and those reiterated without variation, became more intriguing with successive plays. I went from ho-hum to "this is beautiful." A non-musical neighbor who came to talk to my wife loved it at first hearing, so perhaps there's a danger to knowing the lingo of composition: it might possibly get in the way. A composer of great technique, Górecki in reducing his ideas down to the nubbin becomes no less complex, but the nature of that complexity changes from mechanical (complex means) to mystical (simple means, complex emotions). My guilty secret: I love most about the harpsichord the incredible jangle it makes when you pound the keys. The sound attracted me immediately, and I never lost my taste for it. Consequently, the Górecki concerto is for me a pure joy. It's a study in ostinato (Italian for "obstinate"), a clearly defined phrase repeated over and over. The trick of writing a piece like this is knowing when to change, and Górecki works some wonderfully subtle changes into his ostinati. The performance radiates energy, both from the soloist and from the strings. The last movement abstracts folk-dance elements. To me, it's exhilarating. Others may find the work a bit wearing, like listening to marathon bump-dancing in the next apartment. I find Good Night a rather daunting piece and another work "in memoriam." Through most of its length, the only two instruments sounding (mainly in unison) are an alto flute and a piano. Furthermore, the pianist always has the sostenuto pedal down, so we get little clouds of "after-harmonies" composed of the melodic line's decay. Furthermore, a rather restricted interval of pitches is explored, worried, almost, like a tongue on a bad tooth. The tempo is a crawl, with practically no rhythmic variation at all. Compared to this, the Kleines Requiem seems positively opulent. In Good Night, I hear a mind almost shutting itself off during the obsessive repetitions of the Rosary – looking for a wisp of heaven or its own soul. If you've ever seen Orthodox Jews at prayer, "dovening," and you slowed this down so much so that you would begin to see photons moving, you approach the effect of this music. The entrance of tam-tams in the third movement conjures up the depths of the earth and the funeral bell. The voice – with bits of Horatio's "Good night" over the death of Hamlet – comes as a welcome bit of human contact, but that too fades away. Honestly, I don't know what to make of it. However, the performers make an heroic effort – particularly the pianist, John Constable – bringing off pianissimo at tempos so slow, they're just about seasonal. I can't imagine a performance that betters this one. It's so good, so intense, that it won't let me simply blow off the work. I'm going to have to revisit it.